I have always been fascinated by sailboats. I loved to visit my grandparents in Florida, because it meant sailboat rides. This is not the first time I have made a little sailboat. But it is the first popsicle boat I have made. 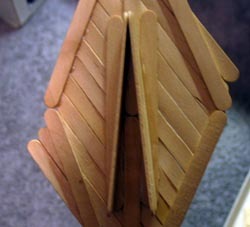 I started out using only the “reject” popsicle sticks that I would not use for my popsicle bridges. This included popsicle sticks that were bent and twisted in all shapes and manners. I am a little surprised that I was able to make this popsicle sailboat look as like it did. I did not start with much of a plan. All I knew was that I wanted to make a boat. So I just started gluing popsicle sticks together. But the boat came out all right, and almost to my surprise, floated! I intended to make this boat into a sailboat from the start. I knew that it needed a high mast, and a big sail. I also knew that like a real sailboat, this little one needed something underneath the boat to keep it from flipping over at the first spit of wind. I also wanted somehow to be able to control where this popsicle boat went. I didn’t, however, come up with a good idea for that. I spent a couple of days working on this, and finally had all the sticks glued together. Then I could cut out the mast from a sheet of paper. I chose paper, even though I knew it was likely to get wet. I figured that a paper mast would be easy to replace in the event of a dunking. The day was windy, as tropical storm “Tammy” was headed our way. But I wanted some wind. I wanted to see my little boat fly across the water. Before I launched the boat, I needed to name it. 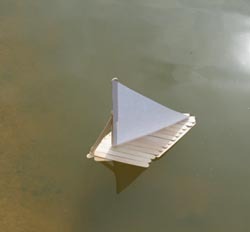 After pondering for awhile, I finally decided on calling it the “Little sailboat that could.” So, I happily went to set it off in the little pond in our backyard. I waited until the wind was slight, and set it in the water and gave it a little push. Everything went beautifully for a moment. But then the wind suddenly picked up, and my little sailboat went right over. Maybe I should have called it the Little Sailboat that didn’t. I hastily fetched a stick and retrieved the sailboat. But the damage was done. The sail was thoroughly wet, and tore at the slightest tension. But I knew what had to do to fix it. 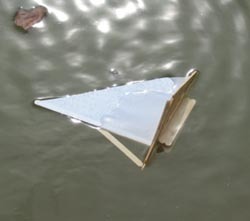 I would add some more popsicle sticks sticking down underneath the boat to help stabilize it. Now the boat is repaired, and I am just waiting for another windy day to try it out again. Really nice! Really seems nice and its looks great! hope it works for us! its a nice lil boat and works well, but i was wondering if you had any bigger boats. Iv done well with 2 of your bridges so if you do get a bigger boat or something please send it to me. Heres a popsicle stick sailboat still in the works. Measures 4’11” bow to stern and 4′ top to bottom. Eventually it will float with sails and motor with remote control along with stain and finishing, sails and more. Very time consuming! Current delay is designing the keel and how to bend the sticks and how much weight. Neat website. I built bridges for the Ga. Sc. Oly. too. Fun competition. Two thoughts for your boat. – Use a fabric sail. Any type fabric will do, but nylon (like sailcloth) will do well. 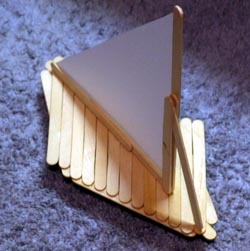 – Popsicle sticks are too bouyant and you need something heavier at the keel. You could duct tape pebbles to the bottom of your keel. The shape of the keel is fine, though. FYI: what country u live in? ?